On one hand, we had to cut our recent camping trip in half because we weren’t properly prepared. So, it might seem as though it was a waste of a weekend. On the other hand, the country was so beautiful that it didn’t matter to us that we essentially drove 6.5 hours round trip just to spend 18 hours at a campground. Alturas Lake Inlet Campground located on the shores of Alturas Lake near Stanley, Idaho, is some of the most pristine country I’ve ever seen. 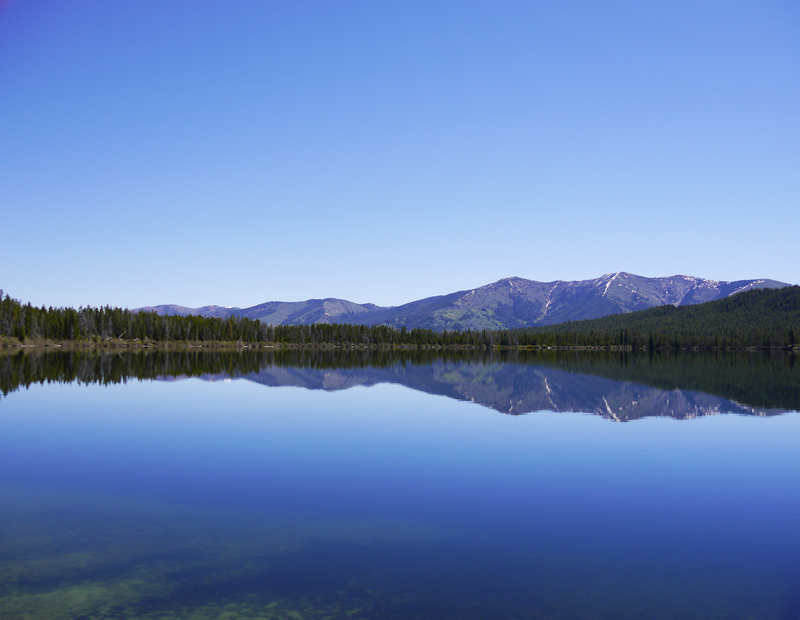 The lack of people at Alturas Lake helped keep the water perfectly calm, making for fantastic reflections of the Sawtooth Mountain Range. The creek running into the lake is crystal clear and teeming with trout. The pine forest, huge grass meadows, snow-capped mountains and nearly absolute solitude make the area a must-visit. Oh, and there are antelopes! I mean, I guess that might not be a big deal to some folks, but I’d certainly never seen one in the wild. And they are just there. You’re driving along a highway, look out the window and there are a jillion antelopes hanging out. Now, as far as why our camping trip was cut short. 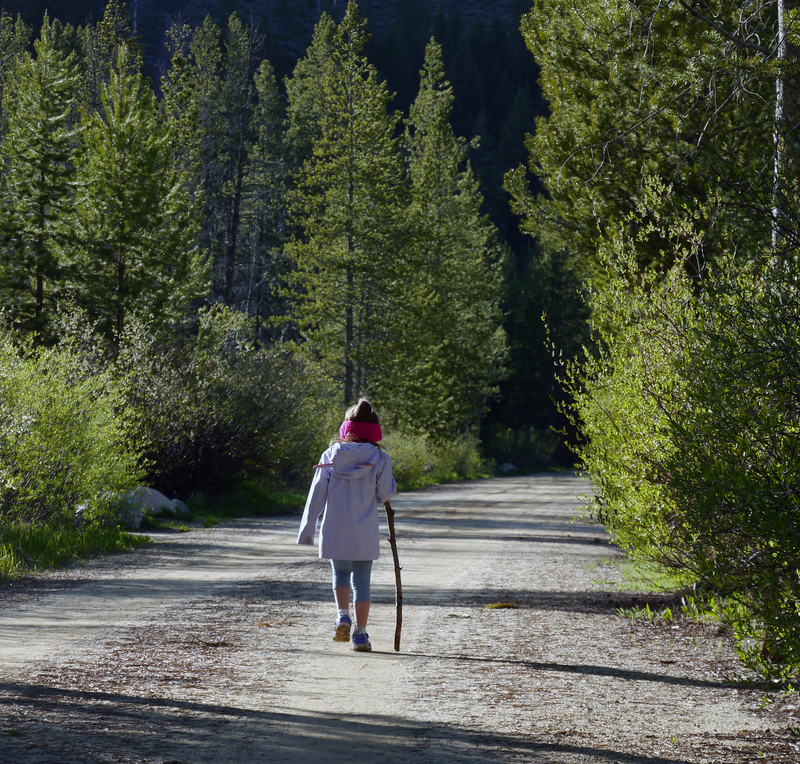 Well, in early June in the Sawtooth Mountains it can get a bit chilly. Cat hiking back to the campsite. Note the winter coat and ear warmers. Nothing like some sub-freezing weather in June! We were camping at 7,000 feet and it was a balmy high of 48 the Friday we arrived. It was so cold, we started a fire at 3:30 p.m. We knew it was going to be cold and had thought our two comforters and Cat’s sleeping bag, plus our dog Molly would keep us warm. That was the coldest night I have ever spent in my life. It dropped down to 26 or so and we were all frozen stiff in the morning. Even poor old Molly was shivering. Getting up and making the fire sucked, but I pushed on thanks to a few cups of coffee. 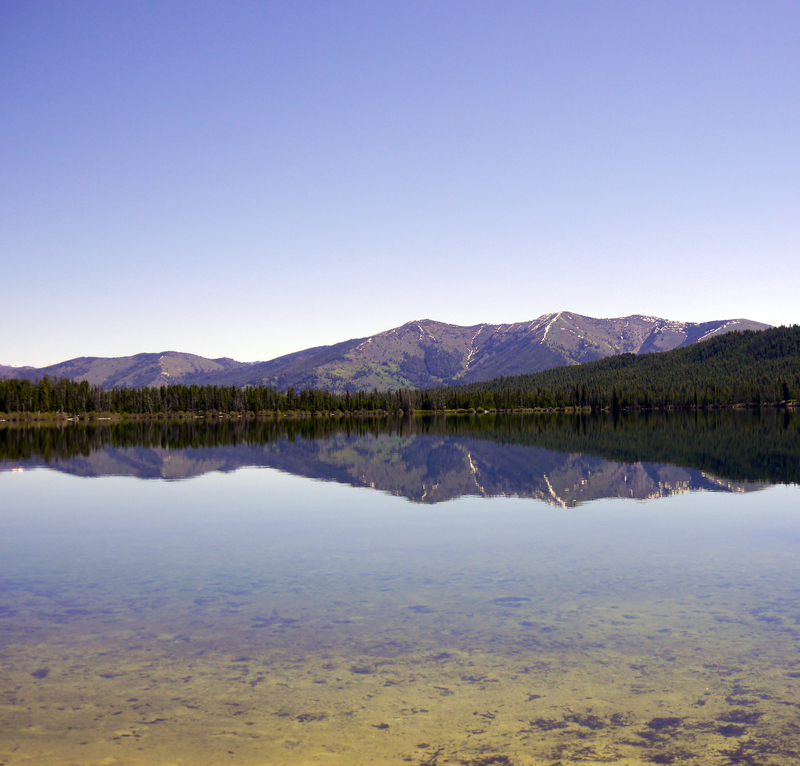 Another reflections photo from Alturas Lake. The water was crystal clear. By 10 a.m. as it warmed up we made the decision that it would be best to just head home and not brave another sub-freezing night in the mountains. Kind of felt like giving in, but we had enough fun that it was worth it. And we will definitely be back. Just in August. Or with proper sleeping bags.